Ken Gerhard is a professional monster hunter. He investigates reports of Bigfoot, the Chupacabras, gigantic winged creatures and other mysterious beasts. Ken's idea of a good time is stalking through the woods at night with his shotgun, dressed in leather. As a cryptozoologist and paranormal researcher, he has been featured on the History Channel's series Monster Quest and also on A&E's Legend Hunters. His book, Big Bird! Modern Sightings of Flying Monsters, chronicles decades of encounters with a monstrous flying animal, reported throughout south Texas. Gerhard has traveled around the world to many mysterious places - from Loch Ness, to Stonehenge, to the Amazon jungle and Machu Pichu, to the Galapagos Islands, Australia, Thailand and Tunisia. What do Chupacabras, Big Foot, the Yeti, and the Loch Ness Monster all have in common? All are folkloric creatures whose existences have been the subject of much debate for centuries and even today. One San Antonio man says where there’s smoke there’s fire. Ken Gerhard, a cryptozoologist (a person who studies hidden animals), held a lecture Friday night in North Austin to a group of about 25 people who wanted to hear more about the unexplained. “I think that people like to imagine that there is still a bit of mystery in our world, that maybe we aren't omnipotent at this point and that maybe we don't know or understand everything about our surroundings and there's certainly quite a psychological and sociological attachment to monsters,” said Gerhard. 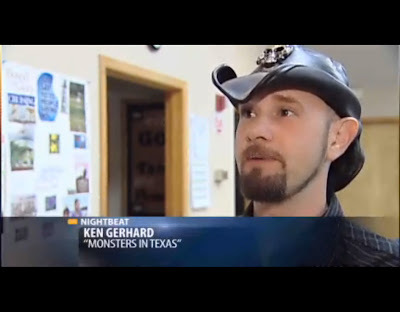 The San Antonio resident wrote a book called “Monsters in Texas” and appeared on several cable shows including “Monster Quest” and “The Real Wolfman”. “I've never had a sighting. I've experienced some things that I can't quite explain and of course I've interviewed many, many witnesses people from all walks of life who seem like very credible people who've had these extraordinary experiences that they can't explain,” added Gerhard. The event was sponsored by Anomaly Archives. I admit to being skeptical of him. There's certain folks in the BF search world I trust and he would not be one of them. Call it a gut instinct or maybe the cheese Aussie hat, but I just don't see him being the guy who will bring us definitive proof. What's up with the leather hat. Looks like a southern hillbilly version of Chris Angel. Stop lumping bigfoot with the chumpacabra. It makes BF look bad! And take off the lame hat if you want anyone to take you seriously! Does this guy work with Billy the Exterminator?